Because people keep asking me for a pattern, which I sortakinda made up, on the basis of a picture of socks in a book--only I changed a lot of thngs. This way I can just refer people to this link. 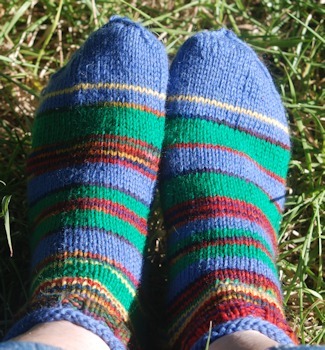 The Sporty Shorty socks are a simple revision of whatever sock pattern someone already likes. They are knit top-down, but could be knit toe-up by a toe-up sock knitter. 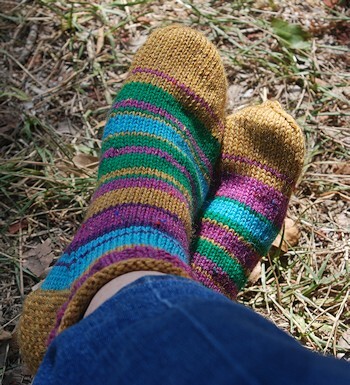 Colors--if you want striped socks, this is a way to use up leftover yarn from other projects. I like to use the same color for the rolled top, the leg below the ribbing, the heel flap, and the toe, as well as some of the foot stripes. This gives a designed quality to the socks, even though the foot striping is random (though in the same colors--though it doesn't have to be.) If I have only a small amount, enough for one stripe, of a color (and it's enough for 3/4 inches of ribbing) I use it for the ribbing. The other colors are used in at least two stripes each. Cast on with one or two-size larger needles than you'll use for the rest of the sock. I use worsted-weight yarn, and size 5 US double-pointed needles. Use whatever you prefer. Cast on as many stitches as you use around your ankle (56 for me) and if you're not used to making socks, cast onto a circular needle so you can wrap the cable around your ankle and see if what you've got is right for you. You do not want the rolled edge to be really snug. I use DPNs; if you like magic loop, set it up your way. Join the cast-on stitches into a round, and with your chosen needle size, knit four rows. Begin ribbing on row 5. I like 2x2 ribbing; the book I was looking at used some other kind. If you're going to make the sporty shorties multiple colors, change colors for the ribbing. Make 3/4 inch (or thereabouts) of ribbing. Change back to Color 1, and knit for 1/2 inch. Put your foot through the knitting and see if you like the way the rolled edge sits on your ankle, and if the stockinette part is long enough to reach the heel bump at the back of your heel. I need 5/8 inches of stockinette; you might need less. Turn the heel and pick up stitches along the side of the heel flap to rejoin with the top of foot. On the next row, begin gusset decreases, making sure the decrease leans the right way: right on needle 1, left on needle 4 (if using 5 dpns.) Depending on the shape of your foot, you can decrease every other row, every third row, or two rows out of three (what I use: high instep and high arch both.) For more comfort, continue the reinforced heel pattern, if used, under the heel. A row of straight knitting replaces the purl rows of the heel flap, and produces a thicker, cushier fabric under the ball of your heel. Takes longer, uses a little more yarn, but feels really good. It can be hard to keep track of whether you're on a decrease row, and whether this is a pattern row or a straight knit row...pencil and paper are handy here, but a pattern "mistake" on the bottom of your heel isn't a disaster. If you are striping your socks, join new colors on the bottom somewhere, and make sure you're not leaving gaps. I make a stitch or two with both yarns to be sure of this (after having to go back ad sew holes together.) Unless you like weaving in loose ends, try to carry your colors forward for more than one stripe, making a two-yard stitch to anchor the floater at least every third row. If you like weaving in ends you can drop the yarn after each stripe, cutting a several-inch tail to be woven in later. A two-color sock is easy to handle--just use both yarns ever 2-3 rows, switching which one is the stripe however it pleases you. You'll have two more tails than a one-color sock, but that's not a problem. Reduce to the number of stitches that feel right on your foot (maybe a hair snugger than you usually knit socks, maybe not) and continue with the foot. Work the toes as you prefer. I have long pointy toes, so I always knit toes shaped to my foot--there's a left and a right sock. If your feet aren't that pointy, the symmetrical toes are faster to do. If you're striping your socks, change to Color 1 again somewhere along the side of your little toe, and (if you want) add a contrasting one-row stripe after 3-5 rows of Color 1. Left: Color 1 is gold, Color 2 is deep rose: ribbing, stripe and toe-accent on each sock. These socks have five colors: gold, deep rose, turquoise, dark purple, green. Right. Color 1 is medium blue, Color 2 is a variegated yarn, used for ribbing and stripes, but not toe accent because couldn't match from sock to sock. So used yellow instead. These socks have four colors; the variegated yarn, when used as a single or double stripe, can look solid over the top of the foot. It has red, orange, yellow, green, blue, and purple in it. So medium blue, variegated, green, and yellow.